E-Cut Fine saw blade. Bimetal with fine teeth for sheet metal up to 1/16 inch, aluminum profiles, copper pipes. Also for GFRP and other hard plastics. Extremely precise and easily controlled cut with an especially narrow cutting line. Medium width, waisted shape for optimal cutting speed and good swarf removal. Wood/Drywall/Metal The MM452 saw blade is ideal for making precise cuts in wood and metal. Bi-Metal (Brim) construction is suitable for cutting finish nails and light metals in addition to wood, drywall, plaster and lath materials. 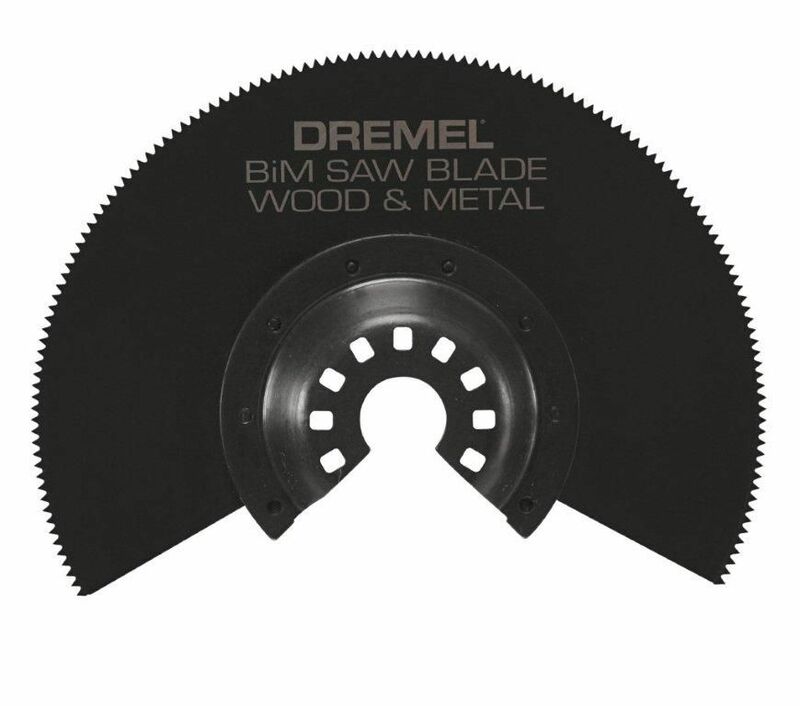 Its offset design allows the blade to make flush cuts and it has the fastest speed of cut of all Dremel half-round oscillating saw blades. Wood/Drywall/Metal is rated 4.2 out of 5 by 57. Rated 4 out of 5 by mitcrellim from This blade works great for trimming molding when putting in... This blade works great for trimming molding when putting in laminate flooring. It does seem to start to dull faster than I expected. I only did two rooms and I could feel it taking longer to cut through towards the end of the second room. Rated 2 out of 5 by Taz from First time purchase. Difficult to align due to large gap at bottom. Goes on my tool in only one o... First time purchase. Difficult to align due to large gap at bottom. Goes on my tool in only one orientation. Did a poor job of cutting OSB. Rated 5 out of 5 by easy from This blade worked great for a tight place under the counter where we had to cut. It definitely ma... This blade worked great for a tight place under the counter where we had to cut. It definitely made the job easy!